Please send me a note on social media (@lindork on Twitter or @lindork on Instagram) if there’s an event you think should be added to this list! Note: a version of this blog was also cross-posted on Explore Edmonton’s Blog. 1. New Year’s Eve Downtown Festival & Fireworks! Time: 6 p.m. to ~ midnight (ish) Fireworks are at 9 p.m. Details: Celebrate the arrival of 2019 at the Alberta Legislature grounds. From 6-9 p.m., join the fun inside the Federal Building for activities the whole family can enjoy, including live music, roving performers, games, lantern-making, a brand new light installation, and more! The celebration continues outdoors on the Capital Plaza with main stage performances featuring the band Rule of Nines, ice carving, fire pits, and bannock-making. This is a fun, free, family-friendly (alcohol-free) celebration. This year’s fireworks show will be enhanced with the addition of pyrotechnics and music. The best fireworks viewing locations are from the Capital Plaza and in front (north side) of the Alberta Legislature. Details: Ring in the New Year with a little… murder! That would be a pretty unique way to welcome 2019, wouldn’t it? I’ve always wanted to participate in a Murder Mystery and Tom Goodchild’s Moose Factory hosts one every year. This New Year’s Eve-themed Murder Mystery includes cocktails, dinner, and seven professional actors dispersed among guests incognito until.. all hell breaks loose! There’s also dancing after the Murder Mystery. This event often sells out so be sure to get your tickets quick if you’re interested! 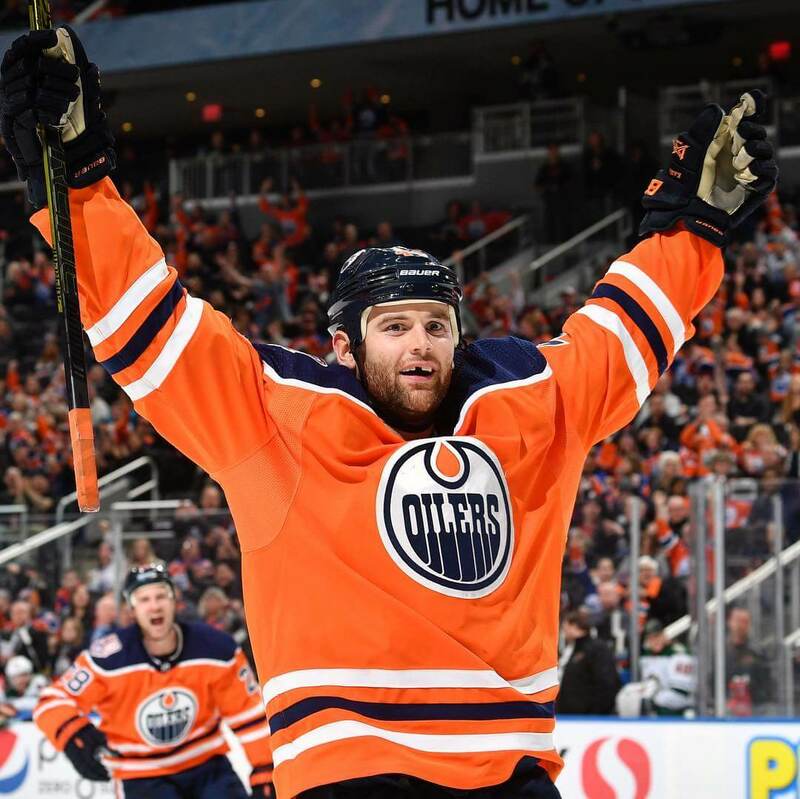 Details: My husband is obsessed with the Edmonton Oilers (like most of Edmonton), so ringing in the New Year by cheering on his favourite hockey team would be right up his alley! The Edmonton Oilers are playing against the Winnipeg Jets in this New Year’s Eve game. This is a risky event to partake in because if they lose it might start your 2019 off on the wrong foot… but if they win—woo! Cost: $28/person early show only. $58.80/dinner and early show. Details: Bring in the New Year laughing! Say Goodbye to 2018 with The Comic Strip’s headliner JR Brow, Mike Lynch and David Dempsey. Note: this is just one of a few NYE comedy shows taking place in the Edmonton area. You can also catch a New Year’s Eve show at Yuk Yuk’s or the New Year’s Eve Comedy Gala at Urban Tavern. Details: New year, new beginnings at the World Waterpark! Come celebrate at World Waterpark featuring live entertainment, good food, a spectacular indoor fireworks show, and great company! There’s no better way to ring in the new year with your friends and family. 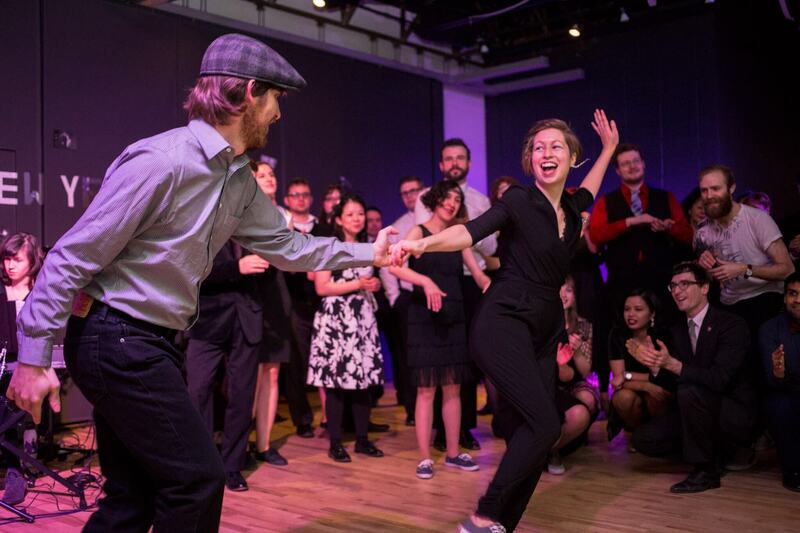 Partake in a Sugar Swing Dance New Year’s Eve! Photo Credit: Nathan Hayashi Photography. Time: 7:30 p.m. to 2 a.m. Details: Step into a ‘Louisiana Fairytale’ as we dance our way into the new year! This year’s Sugar Swing Dance Club New Year’s Eve party is a bayou bash, a nod to the birthplace of jazz. Don your most colourful outfits—purple, gold, green, and blue, or get inspired by mardi gras styles. A beginner dance lesson will get you on your feet and all set for an evening of party! Includes live swing music, live swing dance performances, soul food to put pep in your step, and more! Will this be the year that I finally get to sugar swing my way into the New Year?! Details: Live and Let Die is a full multimedia experience celebrating the music if Paul McCratney. Ring in the New Year to the music of Paul McCartney at the River Cree Casino! Beforehand, grab dinner at the River Cree’s SC Restaurant, and maybe hit the slots afterwards. Note: this is just one of a number of live music performances and NYE events at different music venues and casinos in the Edmonton area. You can see a full list of live New Year’s Eve performances on YEGLive.ca, including shows at Have Mercy Table & Bar, Black Dog Freehouse, the Starlite Room, and the Rocky Mountain Icehouse. Details: Celebrate New Year’s in style, with a party like no other, at the Fairmont Hotel Macdonald! Your ticket includes reception food, entertainment, and sparkling wine. Purchase a $199 ticket for a six-course dinner and dance package too. Ring in the New Year in Edmonton’s 100+ year-old castle. 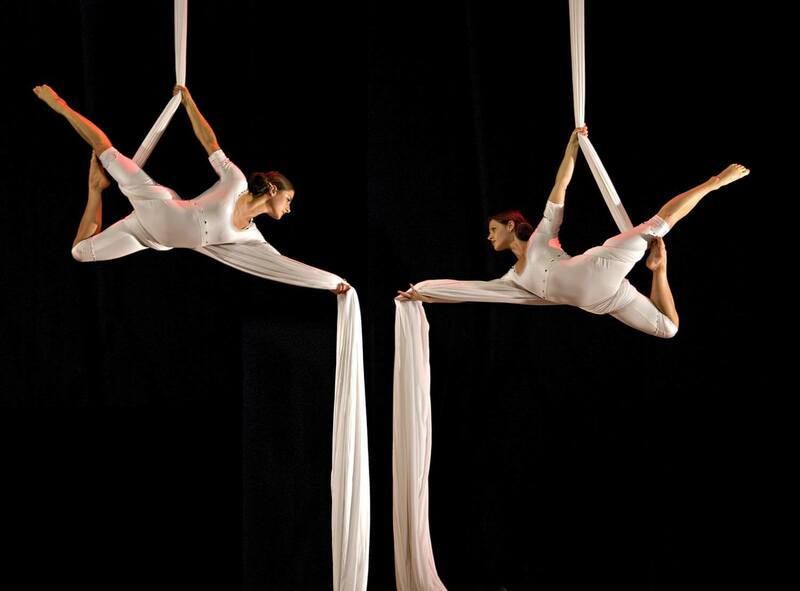 Experience some Cirque de Soleil inspired acrobatics at the Edmonton International New Years Eve Gala! Photo Credit: Eventbrite. Note: this is just one of a few New Year’s Eve dinner + entertainment events taking place at hotels in the Edmonton area. You could also have a vintage New Year’s Eve at Hotel Selkirk Fort Edmonton Park, celebrate at Minutes to Midnight NYE Gala at the Radisson Hotel, or attend one of the other two big hotel celebrations listed below. Cost: $60/person dance only. $115/person dinner & dance. Details: ETOWN SALSA presents its 3rd Annual Felizaño Glitz and Glam Latin New Years Eve for December 31, 2018 to be held at the luxurious Renaissance Edmonton Airport Hotel. It is sure to be a fantastic NYE fiesta as this year the theme is Glitz and Glam! Join hundreds of people ringing in the new year with Latin dance performances, dance lessons, live music, entertainment, and more! Details: Ring in the New Year with a celebration of the wonderful music of ABBA, and other classic bands of the era, as Jubilations tells another tale of love lost, love found and love rediscovered. Take a step back to the crazy 70s when these characters first met and see how lifelong friendships began. Your ticket includes a three-course dinner and the show! Note: there is also a Canada-themed show playing at Mayfield Dinner Theatre for New Year’s Eve as well. Details: Is there anything more Edmonton (at least the last few years anyway) than visiting the Ice Castles in Hawrelak Park? The Ice Castles are getting ready to open and they *might* *should* *hopefully are* open for New Year’s Eve. 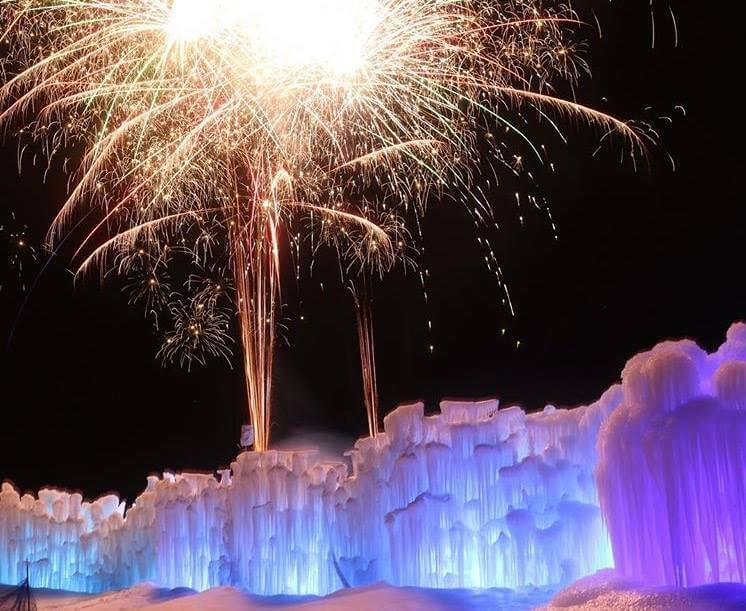 Be one of the first to experience this year’s Ice Castles as part of your New Year’s Eve celebrations! You can currently pre-order tickets, but keep checking to see when the Ice Castles actually open (I’m thinking it should be ready by New Year’s Eve but you can correct me if I’m wrong lol). Alternate idea: A Very Outdoor Christmas—just do a bunch of snowy, outdoor activities… snowshoeing… cross country skiing… etc. Time: 6:30 p.m. – 3 a.m. Details: Would you make a deal to trade in your corkscrew for a prize? Will you pick door number 1, 2 or 3? How lucky will you be this New Year’s Eve? Celebrate NYE at Northlands! Your ticket includes: A delicious celebratory buffet dinner in the Paddock Theatre. A $10 Free Play Voucher. A complimentary glass of champagne. One entry into the Let’s Make a Deal game. And a Live DJ/dance! Location: Your choice. Most restaurants in Edmonton have New Year’s Eve special menus and seatings for dinner. Call your favourite restaurant to see what they’ve got going on, or check out their Facebook Page or Facebook Events. OpenTable lists some restaurants with special NYE menu items but I encourage you to call or look up any local restaurant’s social media to see what special menu or experience they may be planning for New Year’s Eve! Details: Build your own Explore Edmonton New Year’s Eve Adventure! What were some of your favourite places to visit in 2018? Restaurants to eat at? Activities to do? Stretch out your New Year’s Eve so it’s all day. 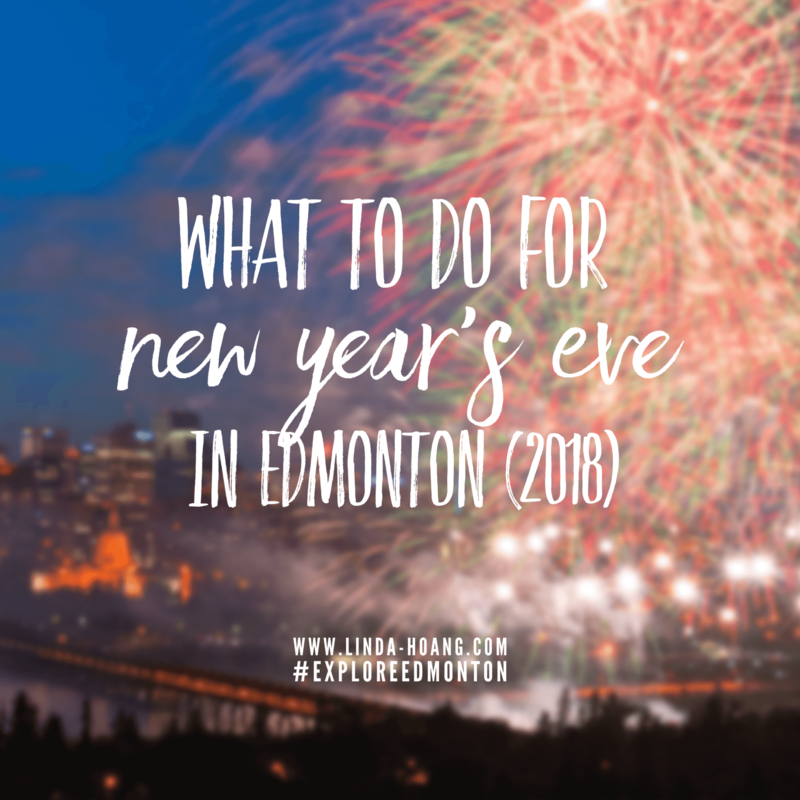 Start with a your favourite brunch spot of the year, visit one of your favourite bakeries, go to your favourite park or river valley trail, visit your favourite local stores, do some impromptu photoshoots at some of your favourite Instagrammable Walls of Edmonton, do a New Year’s Eve dinner at your favourite restaurant, and if you miss the fireworks because they’re earlier this year (9 p.m.) just head to one of the city’s best spots for a view out to our beautiful skyline. Imagine taking in that breathtaking view (fireworks or not), as you close one year and start another! Okay, I wrote this exact same thing last year, but I think it totally still applies this NYE!